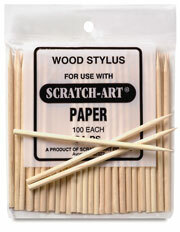 This bag contains 100 wooden styluses, sharply pointed for use with scratch paper. Use them for classroom projects. Each stick measures 4½" (11 cm) long. 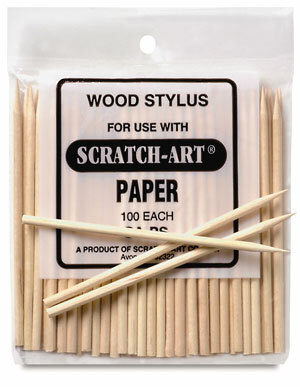 Heavy Duty Scratch-Art Sticks — Each stick measures 4½" (11 cm) long. These heavy duty hardwood sticks are extra durable for repeated use. Package of 25 sticks.